Many women having pregnancy or women’s issues are undiagnosed and therefore untreated celiacs. This opens the door for any number of problematic pregnancy issues. There remains huge unawareness among OB/GYN professionals about the numerous hazards of gluten and how it affects the mother and the fetus. 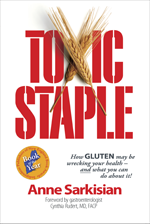 Many of these issues will resolve or not evolve if gluten is addressed with an absolute gluten-free diet. Celiac is a malabsorption issue. When you can’t absorb your vitamins and minerals that keep the body and a fetus healthy a vast array of nasty outcomes may develop including infertility (and sterility), miscarriage, light birthweight, premature births, developmental and learning disabilities, and many more (discussed in Chapter 12: Our Children Are Our Future).